With Readly you can read Your Fund Choices and thousands of other magazines on your tablet and smartphone. Get access to all with just one subscription. New releases and back issues – all included. 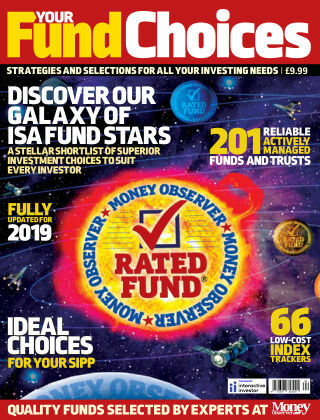 This is the fourth edition of our annual compilation of the funds, investment trusts and exchanged traded funds (ETFs) that we believe will serve investors best in the year ahead - the Money Observer Rated Funds. They have been selected on the grounds of strong past performance and manager quality across a broad range of asset groups, but also to give investors a comprehensive choice of investment styles, so that they can find the funds that match their investment aims. The majority of Rated Funds have made consistently superior returns compared to their peers over at least three years - but some are selected for other reasons. For example, we include ‘specialists’ where comparisons with peers is not very meaningful, and also funds and trusts following specific styles or themes that may have been out of favour recently, but we believe have potential for attractive future gains. This year our Rated Funds include 202 actively managed open-ended funds and investment trusts, plus 65 passive index trackers and ETFs. As well as detailed listings with performance statistics to 1 January and ratings awarded by respected external analysts such as Morningstar and Financial Express, Your Fund Choices also includes a number of features by leading investment journalists, looking at how to use Rated Funds to create a balanced portfolio and outlining a Rated Funds portfolio to pay a £10,000 annual income among other topics.